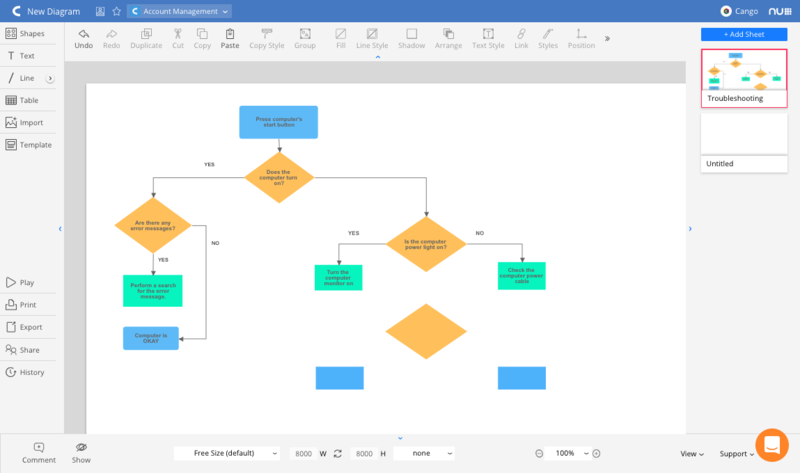 Cacoo's simple and intuitive interface makes it easy to start creating and sharing diagrams right out of the gate. 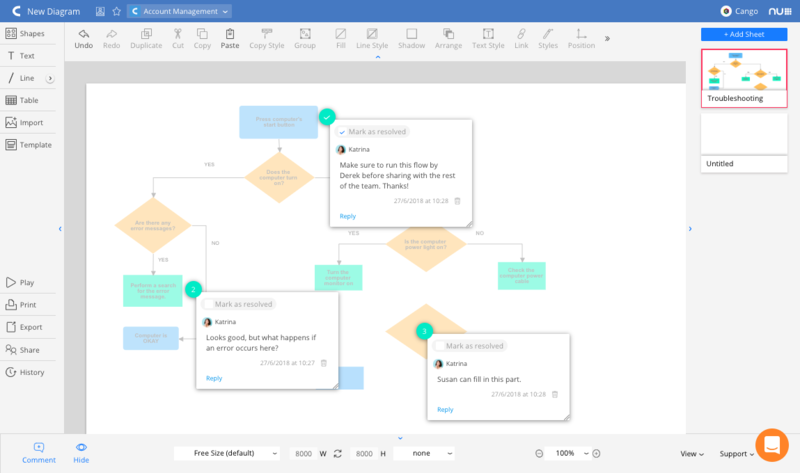 But some people like having a little guidance, so we put together this quick article to get you diagramming like a pro. If you're on the Plus plan, make sure to read the Individuals section. If you're on our Team plan, read both! When you log in to Cacoo, the first thing you see is your Dashboard. 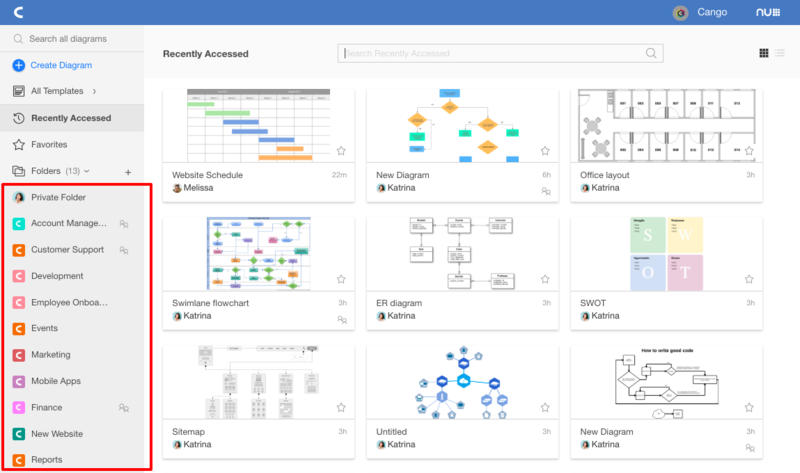 Here, you can view your existing diagrams, templates, and folders. You can also create new ones. To create a new diagram, click the 'Create Diagram' button in the upper-left-hand corner. That button will bring you to the Editor where a dialogue box will present you with template options. You can select a template or select 'Blank Sheet' to start from scratch. 1. Main Menu. On the left-hand side of your editor is your Main Menu. Here you will find all of your options for adding objects to your canvas. You can add a new shape, text, line, or table. You can also import images or select a template. 2. Toolbar. At the top is your toolbar where you will see your customization options for whichever element you have selected on your diagram. e.g. When you select a shape, and it will make the icons for things like fill and border clickable. 3. Sheets. To the right, you'll see previews of all of your sheets. Here you can add, delete, title, and rearrange them. 4. Viewing options. On the bottom are your viewing options where you can edit the size and zoom level of your diagram. You can also show or hide comments as well as add new comments. 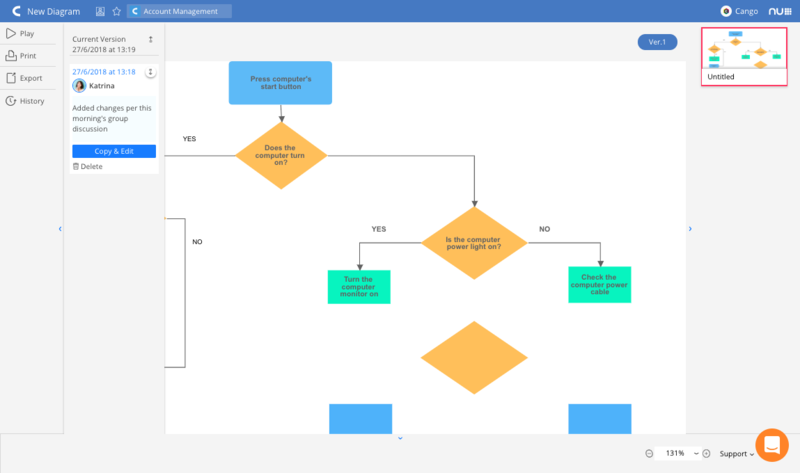 You can also check out our video on How to create and edit diagrams for more details. Your work will auto-save as you go, so whenever you're ready, you can use the Export and Share buttons at the bottom of your Main Menu to select how you would like to share your work. 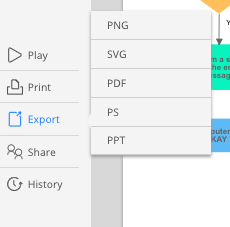 There are several exporting options to choose from, including PNG, SVG, PDF, PS, and PPT. You can share by either sending a copy of your diagram link or adding individuals as collaborators. For a complete list of sharing options, you can also view our Sharing Diagrams in Cacoo video. A Folder can only be shared with three people, even if they're not Cacoo users. With our Plus and Team plans, you gain access to all exporting options and unlimited sharing. For more info on sharing, you can visit our sharing support page. 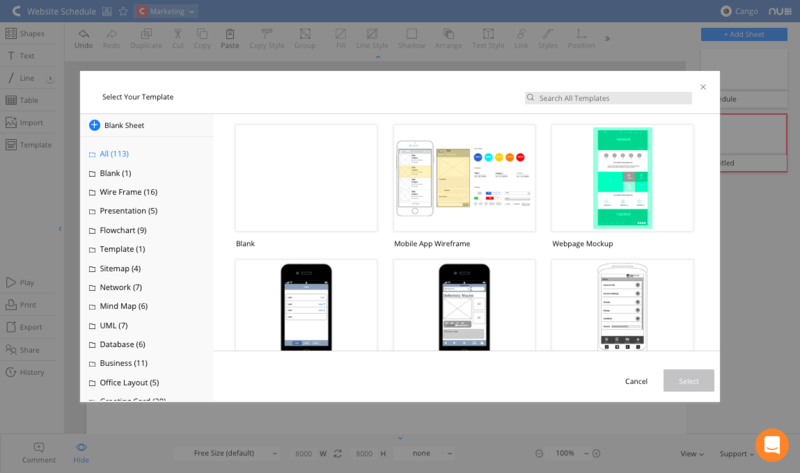 Folders make it easy to share diagrams with exactly who you want. 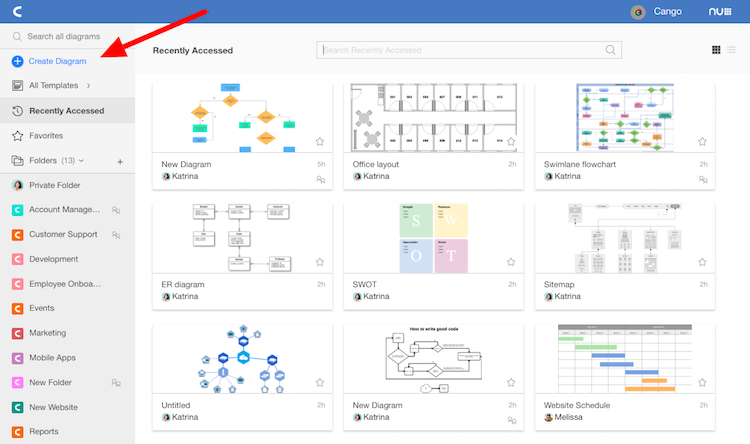 Whenever you add a diagram to a folder, all members can see, edit, and comment on your diagram. But remember: if your diagram is not in a folder, others cannot see it until you share it with them. For more on folders, watch our Managing Folders in Cacoo video. You and others can edit your diagrams simultaneously. Note: The History feature is not available to free users. Check out our Collaborating in Cacoo video for more detail. Account: First, there's your individual Cacoo account that gives you access to the cloud-based software. You control all of the settings and access to this account. Organization: Next, there are the Organizations with which you belong to. You may belong to one or many (e.g. when working with multiple clients who use Cacoo.) This is controlled by your company's Cacoo Administrator. Folders: You have your own folders in your Personal space — as discussed in the Individuals section — and then there are the folders created and managed by each Organization. Diagrams: Finally, there are the diagrams, created by you and others, that live within these various Folders. To navigate between your Personal space and an Organization's space, click the profile photo on your Global Bar and select a space. Note: When creating a new diagram, pay close attention to whether you're creating it within your Personal space or one of your Organization's spaces. Otherwise, your team may not find it. For more information about switching between Personal and Organization, you can read our support document here. Folders keep teams organized. 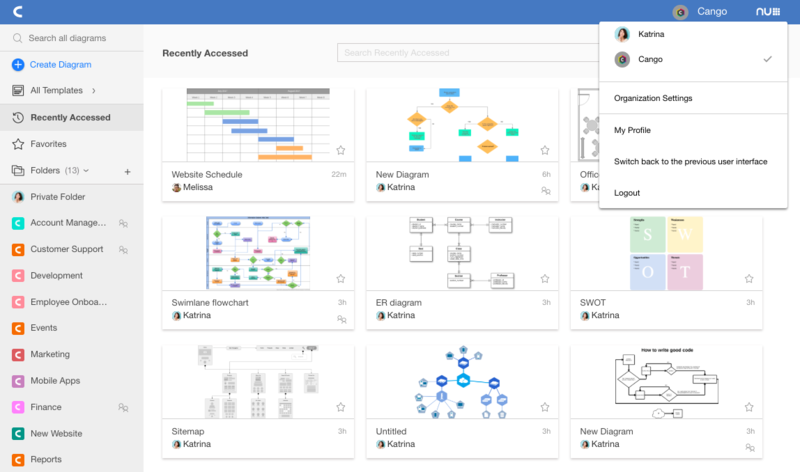 They make it easy to collaborate and protect your diagrams from unwanted eyes. Only Folder Administrators can create Folders, invite users, and restrict access to Folders. So if you're a Folder Administrator, you'll need to learn the ins and outs of creating and managing Folder settings. If you're a regular user, you'll have much less to worry about. Just make sure you have an Administrator grant you access to all the Folders you need. Only members of an Organization can view the Organization's space. And all members are controlled by the Organizations Administrator. Only Organization Administrators can invite and revoke user's access, assign roles, and create/manage teams. If you are your Organization's Administrator, you'll need to familiarize yourself with managing members, roles, and teams. Our How to manage your organization video is a great place to start. Once members have joined your Organization, you can also sort them into Teams, making it easier to invite, change access settings, or revoke access to multiple users without having to do it on an individual level. Now that you know the basics, get to know our Support page and bookmark it for any technical help you may need in the future. Then check out our Resources page for more videos, long-form guides, and customer stories. And remember, you can always contact us if you have any questions; we're here to help.